On April 8th, we kicked off our Wall of Generosity Fund Raiser. This will be the easiest and simplest fundraiser ever! It is an opportunity for each of us to contribute just a little bit more to our church. 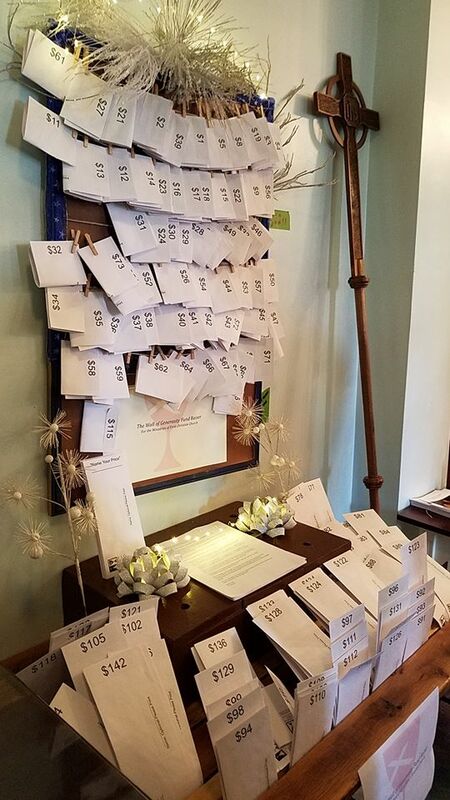 Envelopes will be labeled from $1 to $144 – and posted on the Wall of Generosity just outside of the sanctuary. There is approximately one envelope for each person who regularly attends worship at FCC. • take an envelope of their choosing, picking an amount that they feel comfortable contributing above their pledged or regular giving. • place that amount of money in the envelope. If they choose to add their name to the envelope, the amount will be included in their quarterly report of giving to the church. 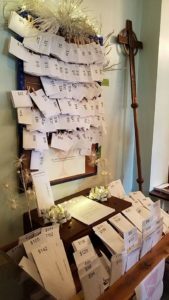 • return the envelope to church, and either place it in the offering plate during worship, mail it in, or drop it by the church office during the week. You can even send it by carrier pigeon, if you like. There will be a few additional envelopes marked “pick your amount” if anyone would like to contribute a different amount. Rule breaking is encouraged. You can put more money in the envelope than the envelope calls for. You can take more than one envelope. Just remember – contributions to the Wall of Generosity are above and beyond our normal (pledged) giving! Let’s all celebrate the ministries we share at First Christian Church and with our wider community with our generosity.